The Bosnian global last started a Premier League clash against Southampton on December 10th. Wenger's side gradually took charge and they forced the breakthrough in the 24th minute when Palace's failure to clear Mesut Ozil's free-kick eventually led to Mustafi's opening goal. 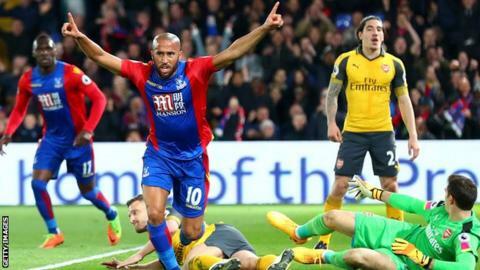 Shkodran Mustafi opened scoring for Arsenal with a composed finish, but Andros Townsend equalized for Palace at the start of the second half. Granit Xhaka had already gone close when, in the 25th minute, as Palace struggled to clear their lines, Alexandre Lacazette's shot forced Julian Speroni into a save that only reached the unmarked Mustafi, who tapped-in easily. Despite James Tomkins ensuring a nervy finish for the visitors with an 89th minute headed goal, the win left Arsenal still in sixth place but they moved on to 37 points, alongside Tottenham Hotspur and to within a point of the top four. Speroni, Kelly, Tomkins, Dann, Schlupp, Milivojevic, Cabaye, Loftus-Cheek, Townsend, Zaha, Benteke. 38' - Palace are struggling to create anything now, and Arsenal break on them with alacrity, Ozil spreading to Sanchez who accelerates down the left and returns possession. oh I say, that's a lovely first touch from Ozil, killing the pace, taking the ball into his stride and losing two men, then shooting with his instep. but Speroni saves well, getting just enough on it to take it away from Lacazette. Wilfried Zaha was Palace's most threatening player throughout the first half with the Ivorian maintaining the form that has seen him linked with a number of top clubs this season. The midfielder has been one of the most consistent players in Hodgson side this term and has popped up with important goals from the penalty spot, including the opener in the 1-1 draw with Swansea last time out. Palace remain one point off the drop zone.